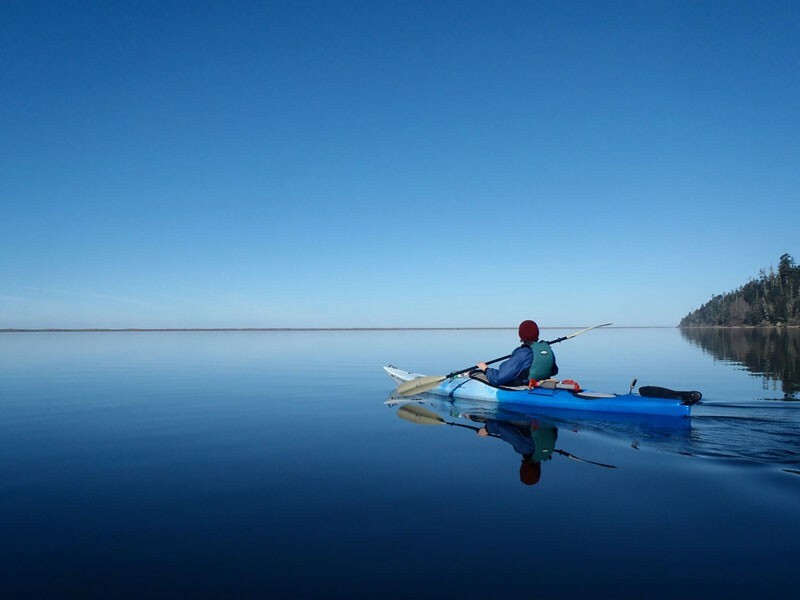 Photo by Marna Powell Paddling the lagoon mid-winter — it's not the Arctic, people. Ok, Humboldt. It's time to get over it. Enough whining about the frost, your shivering and your wool socks. It's not that cold out. You know what they call crisp air, blue skies and frosty mornings in most parts of this country? Fall. Most of us don't even own a real winter coat or a windshield scraper. And it's not really raining. So stop feeling sorry for yourself, put on another fleece and let's get out already. Combine some shopping, art appreciation and cycling by riding your bike to the Fire and Light factory. On Fridays, there are free tours of the factory, where you can watch artisans pour glass. To take a tour, call the Humboldt Bay Tourism Center at (800) 808-2836 or call Fire and Light directly at 825-7500. Begin your ride at Arcata Plaza. Ride G Street north toward campus. Turn right onto 17th Street and immediately turn left onto LK Wood Boulevard. Cross over Highway 101 on St. Louis Road. Enter the traffic circle, taking the second exit onto West End Road. Stay on West End Road for about a mile. Turn right onto Alder Grove and then left onto Ericson Way. Follow the signs to Fire and Light. The ride is a little over 3 miles. Once you've warmed up from your tour, you can turn around and return the way you came. Or you can continue on West End Road another 7.5 miles out to Blue Lake (highly recommended). This is a bigger commitment, but a warm seat by the wood-fired pizza oven at Stardough's Café (H Street and Railroad Avenue) awaits if you are willing to make the journey. Did you make it down there for Christmas? Either way, while away a post-holiday winter morning in Ferndale's hills and reward yourself with a slice of pie for getting all cold and muddy. Russ Park is a sadly underused stand of grand firs and Western Red cedars just outside of Ferndale. Drive through town and turn left onto Ocean Avenue, which becomes Bluff Street. There is a tiny parking lot on your right after half a mile, and a sign and park map at the trailhead. You can hike most of the trails in the park by following a figure-eight loop that links the Lytle Ridge, Francis Creek, Daddy Bush and Eucalyptus trails. It's only a 3-mile loop, with significant elevation gain and a few beautiful viewpoints of the Ferndale valley. When you're done with your hike, change into a pair of dry socks and warm up with a cup of coffee and a fresh-baked slice at Ferndale Pie Company (543 Main St.) before heading home. Water sports are not a summer-only activity. This year, winter in Humboldt means cold, crisp sunshine and calm water on the lagoons north of Trinidad. Stone Lagoon is particularly pretty and protected, so being on its waters feels like a wilderness experience (but with all the perks of a drive-up launch). Kayak Zak's operates out of the Visitor Center at Stone Lagoon year-round, so you can bring your own boat or rent a kayak or stand-up paddle-board from them. Call ahead at 498-1130 to arrange a rental. The Visitor Center is located at 115336 Highway 101. Wear warm synthetic layers and a lifejacket, and paddle aimlessly in circles or make your way across the lagoon to the Stone Lagoon Campground. The campground is closed until February, but it's open for day-use now. There are several fire circles at the campground and lots of neatly stacked firewood from this year's trail maintenance. Bring a bag of your own dry kindling (or a Duraflame firestarter log because, you know, life is short), some marshmallows and hot dogs, and have yourself a deliciously cozy lunch break. This easy round trip is about 4 miles long.